Come and experience our new Comforts of Home&reg Bedding Collection. Our brand new Candlewood Suites Hotel is located off I-180 in beautiful Williamsport, PA, home of the Little League World Series. 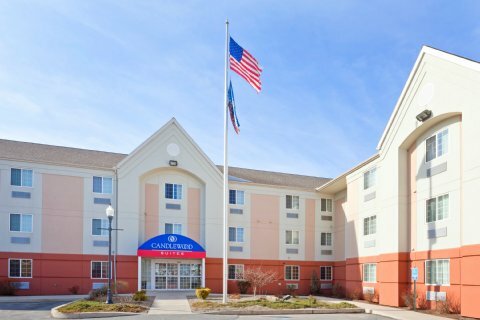 The Candlewood Suites Hotel is just minutes from major Williamsport businesses such as the Williamsport Regional Airport, Pennsylvania College of Technology, Lycoming College, Brodart, Woolrich, Kellogg's, Susquehanna Health Systems, Textron Lycoming, & Grizzly. Our hotel offers great relocation rates through Williamsport's GMAC, Remax, & Prudential offices. Located in the heart of central PA, our hotel is close to many area attractions that include Penn State Football, Pennsylvania Grand Canyon, Knoebles Amusement Park, and various PIAA & NCAA tournaments. At the Candlewood Suites Hotel in Williamsport we put the amenities where they belong, in your room The fully equipped kitchen allows you to cook meals and relax in the overstuffed recliner while watching a movie from our free DVD collection. An executive style desk allows you to work in the comfort of your room and access the web with our free high speed Internet. Working out just got easier in our free fitness center or take advantage of our free laundry room Great alternative to a corporate apartment. The Candlewood Suites Williamsport is also within walking distance of many local restaurants including TGI Friday's. Receive 1,000 Priority Club Points when you stay with us. This hotel is committed to providing accessible facilities under the American Disabilities Act. If your accessibility needs are not met, please contact the Hotel Manager on Duty. Should you require additional information regarding accessible facilities for guests with disabilities, please call 1-800-Holiday (U.S. and Canada) or contact the hotel directly. For the hearing impaired, TDD service is available at 1-800-238-5544 within the U.S. and Canada.